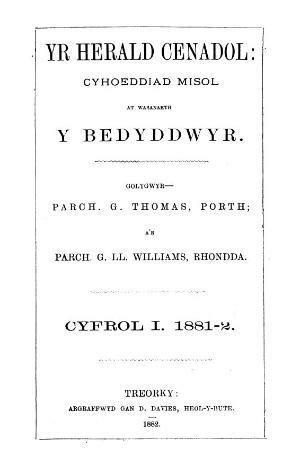 The monthly Welsh language religious periodical of the Baptist Missionary Society. The periodical's main contents were missionary news, biographies of missionaries and articles on foreign countries and their peoples. Amongst the periodical's editors were the ministers G. Thomas, Griffith Llechidon Williams (Llechidon), William Morris (Rhosynnog, 1843-1922) and Edwyn Edmunds. Associated titles: Herald Noddfa (1899); Yr Herald Cenhadol (1906).